What to Pack For An Active Back to School! 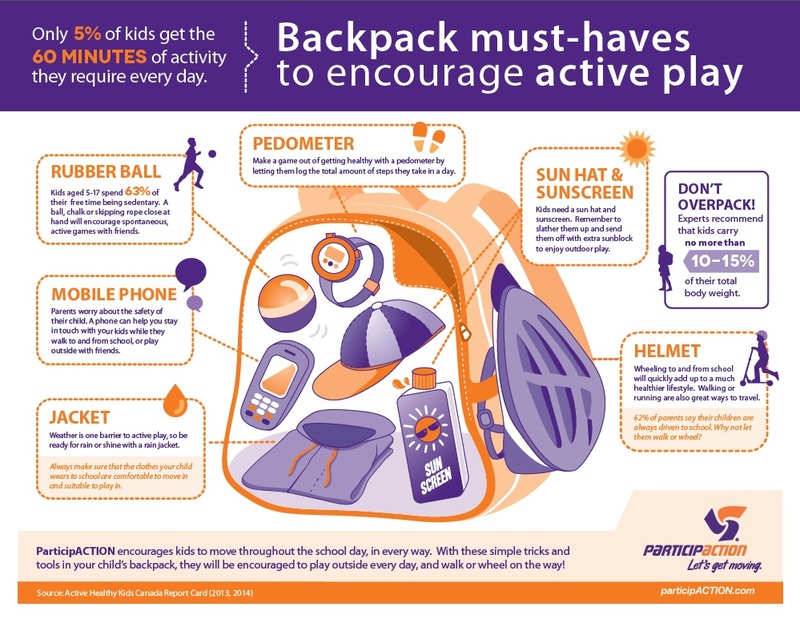 Thanks to ParticipACTION, it’s know easy to know what to pack for an active and fun back to school experience. There are lots of great ideas in this cute infographic, but I love the idea of a ball. So simple and cannot only lead to active play, but also social interactions. Great for students entering a new school or class. The use of two little words “wanna play?” can lead to new friendships and an active recess. In order to make this back pack even better, I would suggest the addition of a reusable water bottle. As both a classroom and phys.ed. teacher I believe it is so much easier for students to stay connected to the learning when they have everything they need at their fingers tips, including hydration. As we enter the final weekend of summer, I wish students, teachers, and parents an awesome start to school week one!